McMurty’s comments follow earlier reports of Sandmann’s legal team preparing a large-scale lawsuit against subjects whose public criticism of Sandmann may have crossed certain lines. 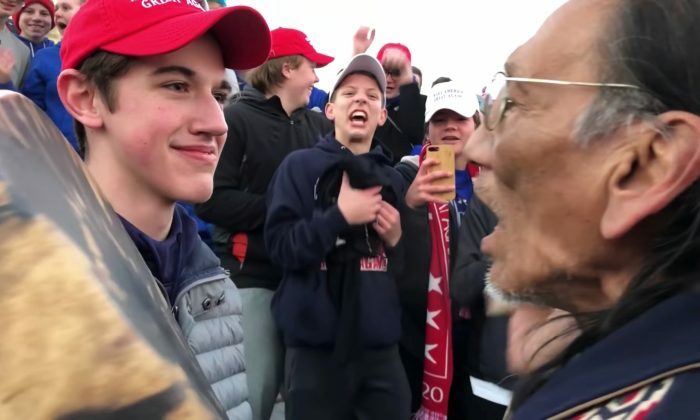 Sandmann, the 16-year-old seen in the viral video standing in front of Nathan Phillips playing a drum, faced rebuke by prominent figures like actor Jim Carey, actress Alyssa Milano, Sen. Elizabeth Warren (D-Mass. ), as well as media organizations like The New York Times and The Washington Post. The group of Covington students was waiting for their bus near the Lincoln Memorial after the Jan. 18 March for Life in Washington, when they were approached by several Native American activists led by 64-year-old Nathan Phillips, drumming and chanting. Sandmann and Phillips faced off. It was caught on video and went viral. “As reported in our liberal media, it was a blatant expression—by the boys, no less—of racism, privilege, tribalism, and hate,” wrote Adams. But then a longer video of the incident—with more context—later emerged, prompting a re-evaluation. Many who initially rushed to slam Sandmann issued apologies, retractions, or simply deleted tweets. Others doubled down in their reproach. The extended video showed how the Covington Catholic High School students were being harassed by a group of Black Hebrew Israelites before the Native American group stepped toward the students while playing drums and singing. The image was initially interpreted by the media as a racial confrontation, with the white high school students as the aggressors. “The students chanted spirit songs from their Catholic high school in Kentucky to drown out the torrent of racist, homophobic, and bigoted verbal abuse from the BHI cult,” Adams said of the incident. The 15-minute video paints a picture with much more context than the short viral video clip that led to the initial outrage. He interpreted the fallout from the confrontation as a case of identity politics gone awry. Another of Sandmann’s attorneys, L. Lin Wood, was cited by Fox News as saying that the legal team has expanded the potential list of accusations to cyberbullying and assault. “Defendants who have intentionally joined a cybermob aimed at harassing and threatening a teenager have good reason to be legally concerned,” Wood told Fox News in a statement. McMurty alleged that Sandmann’s future had potentially been harmed. “I think we need to recognize that reputations should not just be disposable by journalists in this internet era. In this case, you don’t have the president, or the speaker of the house, or a public figure, you have teenagers,” said Gibbs. “But when you look at an ongoing defamation where false statements are being made, where they’re being labeled as terrorists or troublemakers in this internet era, that’s a branding that the journalists should be held responsible for.